Do you want to become Shrewsbury Town FC’s new mascot? 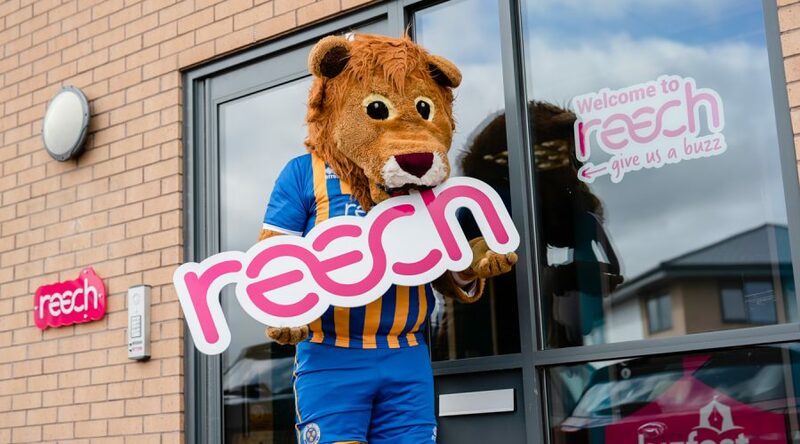 Reech is working in partnership with Shrewsbury Town in the Community (STITC) to host a ‘Lenny the Lion’ competition to become Shrewsbury Town’s Football club ‘Lenny the Lion’ mascot for one game. We want you to get out your creative wand out and create a colourful piece of artwork that shows Lenny the Lion enjoying his favourite activity when he’s not being a football mascot. Perhaps Lenny could be watching a film in the cinema, sunbathing at the beach, shopping or even walking the dog -let your imagination run wild and be as creative as you can! The competition is now open so get drawing, painting and colouring! The competition has been split into two age groups 2-6 and 7-11. The top three entries from each group will be invited to join us at Shrewsbury Town’s home game against AFC Wimbledon on the 2nd March where the three top pieces of work will be showcased. The overall winners from each group will be announced at half time and will then be given the chance to become Shrewsbury Town’s home mascots on the 16th March against Wycombe Wanderers. In addition to this, we will present a prize to both winners! All the entries will be judged by our very own graphic designer and the creator of Shrewsbury Town in the Communities Lenny the Lion illustration, Jonny Varrall. Lenny the Lion is the official mascot of Shrewsbury Town Football Club and is very popular amongst the Shrewsbury community. Our very own Graphic Designer, Jonny Varrall designed and developed the famous Lenny the Lion illustration which is featured across both the Shrewsbury Town in the Communities website and the Shrewsbury Town Football Club’s website. Jonny was also the creator of Lenny the Lion’s wife, Mrs Lenny. “I’m very excited to be judging the ‘Lenny the Lion’ competition and I’m looking forward to seeing all of the creative drawings that come in. It’s important when you are designing anything to be as creative as possible and add as much colour and detail as you can.